More misadventures with the lovable blue Dragon. 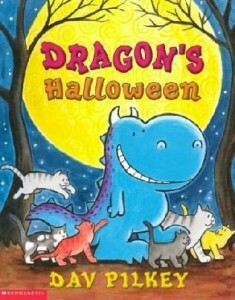 Dragon wants to make a big jack-o’-lantern, but can only find six small pumpkins. Though some bullies come along to try and ruin his fun, Dragon perseveres and scares them off. Dragon also gets invited to a costume party and gets scared by his own grumbling stomach in the woods. Dragon gets ready for Christmas! Though everything doesn’t go as planned, dragon helps make Christmas special for others in need and get a Christmas treat in the end. INFO: Hastings, Jack. Our Class Pet. I. 2004. DESC: This book follows a class as they pick out a class pet. It also shows how they take turns caring for their pet rabbit. How to Draw a Dinosaur. I.
DESC: Great how-to book with easy instructions for students. They can follow along and draw their very own dinosaur! When I Grow Up. I.
DESC: This book explores several career opportunities for young students. DESC: This book highlights many different famous astronauts, different space missions and what astronauts do. It has some great pictures.